Are you applying for a PAN Card? Get a complete list of all the documents required for PAN Card application. The application for PAN Card requires a definite set of documents. Submission of proper documents will speed up the processing of your application. We have already posted how to apply for PAN Card online. During the process we mentioned some of the necessary documents required for the PAN Card Application. This article gives you a complete knowledge of all the PAN Card documents. You need to submit them while applying for a Permanent Account Number. The list also shows you which documents will be acceptable to the authority. PAN Card is issued only after verification of the documents submitted. A PAN Card can be obtained by an individual or by a firm. No matter whether you are applying as an individual, as a HUF, as a company or as a partnership firm. All the required set of PAN card documents is listed here. You just need to prepare a set of documents as per the given check list. If you are not aware of the online procedure of PAN Card application, refer to the related post at our blog. Three basic types of documents required for the PAN Card application. These are- proof of identity, proof of residence and proof of DOB. Many documents are used as a proof of identity and residence. We have listed here which documents are acceptable as proofs by the income tax department. The online portal of income tax provides information on PAN Card Application Form documents. We have shared the list separately with segregated information for an easy understanding. Here is the list of documents required for PAN Card application by any individual and HUF. Some additional documents in case of Hindu Undivided Family are also listed. (B) In the absence of any of the above proof, the original certificate of identity signed by an MP or MLA or MC or a gazetted officer in the prescribed format. (C) Original bank certificate with duly attested photo of the applicant. The letter should be on the letter-head of bank branch with stamp and sign. It should also mention the bank account number of the applicant. If PAN Card application is for minor, proof of identity of parent or guardian is valid. For HUF, an affidavit by the karta of the HUF is required. The affidavit should state name and address of all the coparceners. Proof of identity listed above is also required. An allotment letter of accommodation. The letter should be issued by a state or central government. It should not be more than years old. (C) The original certificate of address signed by an MP or MLA or municipal Councillor or any gazetted officer in prescribed format. The documents required for passport application is also similar and is mentioned as well. Birth certificate issued by a local municipal authority. Or any office authorized to issue certificates of birth and death. Photo ID card issued by the central or state government or PSUs with the date of birth. a) Certificate of Registration issued by the Registrar of Companies. b) Or certificate of registration number issued by Charity Commissioner. While submitting the application make sure, you have filled all the necessary details for PAN Card in order to get it in the quickest possible manner. This was the complete list of documents required for PAN Card application. The online application for PAN Card is made through the portals of the UTI and NSDL. The documents required for PAN Card are then submitted to the NSDL or UTI office. After you submit your application, check PAN Card status online right from our blog. All above documents required for PAN Card also apply to application for duplicate PAN Card. For duplicate PAN Card, applicant has to provide his PAN number. PAN Card is a significant document to carry our certain financial transactions in India. PAN Card is now an essential document to open bank accounts and claim benefits like PF. In case, if you found errors in your document or PAN Card, you can always fill the PAN Card Correction Form to get the details corrected. It is your duty to verify PAN Card online and every detail given in it. My mother name does not have any initial or surname in that case how will I get my mother pan done. 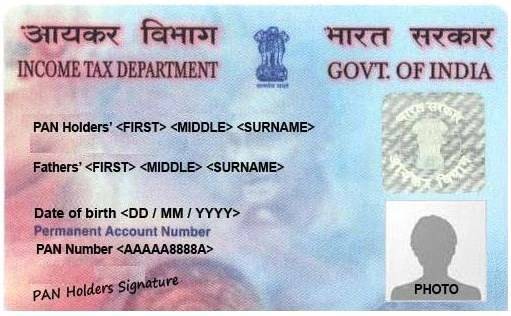 CHANDRA MARNDI on PAN Card Details – What to Fill in PAN Card Application Form? Gopabandhu Mohanta on PAN Card Details – What to Fill in PAN Card Application Form? ipancardstatus is a portal designed to help Indian users to learn pan card, income tax and everything connected inbetween. At our site, you'd be able to find plenty of information and guides ranging from tracking of pan card status to method to apply for pan card online. Overall, ipancardstatus.co.in is a one stop solution for Indian readers to know your pan. Besides that we have also covered Aadhar card and passport related queries to make everything easier for Indian users. You can reach us by using contact us form.